Stereotactic radiosurgery (SRS) is an important therapeutic option for the care of patients with an intracranial arteriovenous malformation (AVM). It can achieve complete obliteration of blood flow within the AVM, thereby eliminating the risk of future intracranial hemorrhage. The overall morbidity of SRS in AVMs is relatively low. 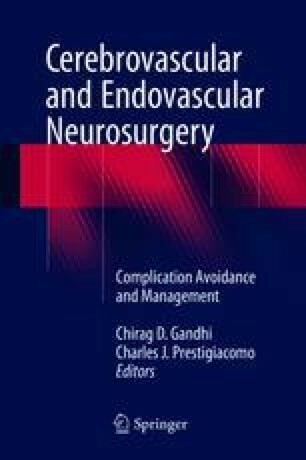 However, complications can arise subsequent to SRS of AVMs and include most commonly delayed hemorrhage, hemodynamic effects on the regional brain from AVM vessel closure, radiation injury to the adjacent brain, and delayed cyst formation. This chapter reviews the principles of complication avoidance and management in the radiosurgical management of AVMs.